Cockett Inn near Cefn Coed Hospital and old quarries near by, 1953. Reproduced from the (1953) Ordnance Survey map, without reference to the Cockett Inn..
(C) H34 BUILDINGS, COMMERCIAL BUILDING, INNS, PUBLIC HOUSES, HOTELS, SOCIAL CLUBS 1873 12 Sept. Swansea licensing: William Williams, Cockett Inn, Cockett, double licence P6. P532 KELLY'S DIRECTORY 1891 Cockett. Commercial. Thomas Thomas (Mrs.), Cockett inn. 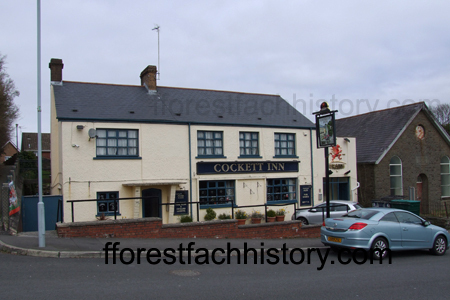 The Cockett Inn can be seen from OS maps of 1879 - to date 2012, currenly still in use. after which it slopes down again to meet the cross-roads and traffic lights by Cockett Bridge and Station." N.L. Thomas, Swansea District and Villages - Cockett p.100, printed 1969.